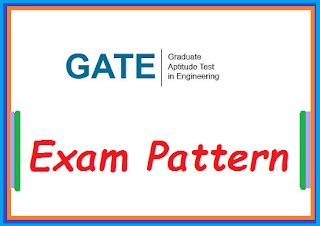 GATE 2019 Exam Pattern is now available on this web page. The candidates who are searching for the GATE 2019 exam pattern over the internet may get it from here. The candidates who recently applied the application form online must start their preparation with the latest exam pattern released by the exam authority on the official web portal. The candidates should start their preparation of the examination after submitting the GATE 2019 application form online. Scroll down this page and get more details. The exam authority will release the exam pattern of the examination online with the notification of the examination that already released by the IIT Madras on the official web portal. The interested candidates who want to obtain good marks in the examination should go through the GATE 2019 Exam Pattern available here. Stay tuned this page to get information about GATE Exam 2019. The GATE 2019 Notification was officially released on the 6th July 2018 on their official web portal. You should go through the details of GATE 2019 exam pattern before appearing in the examination. It will help you to prepare better for the examination. As you will able to know the subject wise marks and easily make the strategy to obtain high marks in the examination. You should go through the details of exam pattern given below on this page. The board will conduct the GATE exam in the February month for the candidates who applied the application form online. The candidates who already started their preparation should check the GATE 2019 Exam pattern as well to know the question paper style. You can perform better in the examination and get more marks by implementing the proper strategy. The candidates have enough time to prepare for the examination. Keep in touch with us for latest updates. The GATE examination will be conducted for 24 papers. The exam of GATE has the duration of 3 hours and will consist of both multiple choice and numerical answer type questions. The General Aptitude will be common in each question paper. The candidates will face the questions as per their choice making during application filling process. The exam contains total 100 marks. The board will release the GATE 2019 Exam pattern online to allow the candidates for better preparation. The General Aptitude section is mandatory or common for each paper which will have a total of 10 questions. The five question will consist of 1 mark for each and remaining five will be for 2 marks. So, the section contains a total of 15 marks. The candidates who are going to participate in the GATE 2019 Exam should know about the GATE 2019 Marking scheme. As the exam pattern of the exam will help you to prepare the strategy for the examination, it will help you to know the negative marking. · 1/3 mark will be deducted for every incorrect answer of 1-mark MCQs. · 2/3 mark will be deducted for every wrong answer of 2-mark MCQs. · There will be no deduction from the total score if question unattempted. · The numerical Answer Type questions are not following the negative marking scheme. Thanks for visiting here. Wish you good luck. Have a Nice Day!